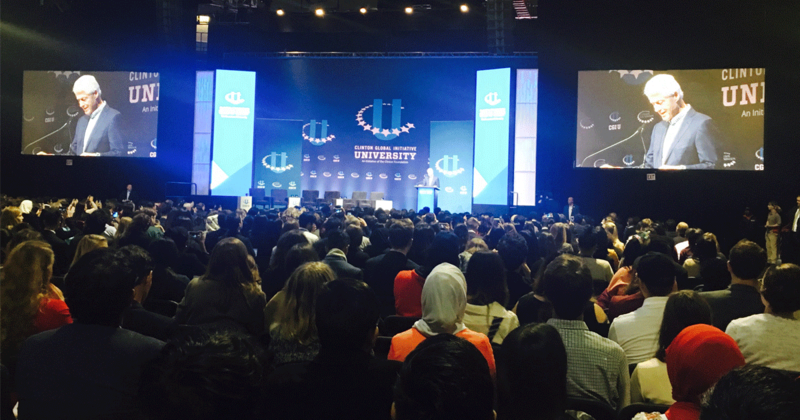 Every year, the Clinton Global Initiative University (CGI U) conference gathers hundreds of students to take action on the world's most pressing challenges. All attendees develop Commitments to Action, which are proposals for ideas or projects that aim to solve issues in local communities or abroad. Through CGI U, students have the opportunity to learn how to implement sustainable and responsible change, meet and learn from world leaders , and share ideas with fellow commitment-makers. The CGI U 2017 conference took place at Northeastern University and was attended by six Tufts International Development (TID) members. Mia Ellis, Rachael Meyer and Ayotola Onipede participated in the conference representing TID’s project on community health, which aims to establish a nursing school in rural Honduras. Working in partnership with Action for Education in Trinidad, Honduras, the goal is to open an auxiliary nursing school in the region. Once completed, this project will provide an affordable, higher education opportunity for local residents as well as strengthening the healthcare workforce in the region. Camila Rovalino, Clemencia Pinasco and Cristina da Gama also participated, and their project involves implementing digital learning programs in earthquake-affected communities in Ecuador. The team is partnering with the NGOs Libraries Without Borders and Avanti to implement e-library kits that aim to resume and strengthen education in Coaque, an earthquake-struck Ecuadorian community. The e-libraries utilize asynchronous technologies to provide access to web-based tools offline, allowing local educators to make effective use of high-quality and relevant education technologies to achieve educational outcomes. At the conference, students had the opportunity to attend specific, project-related panels in five different areas: funding, organizational capacity, monitoring and evaluation, design practices and marketing and media. Other panels focused on more general topics related to students' personal and professional formation, including those such as "Skills vs. Degrees" and "Is the Sharing Economy Sustainable?" Additionally, students learned from professional leaders and fellow students about how to improve and innovate methodologies for program implementation, as well as how to enact responsible change through economic development. Some of the speakers included Bill Clinton, Chelsea Clinton, Madeleine Albright, David Miliband, and Paul Farmer who shared their experiences and discussed innovative solutions to pressing global challenges.